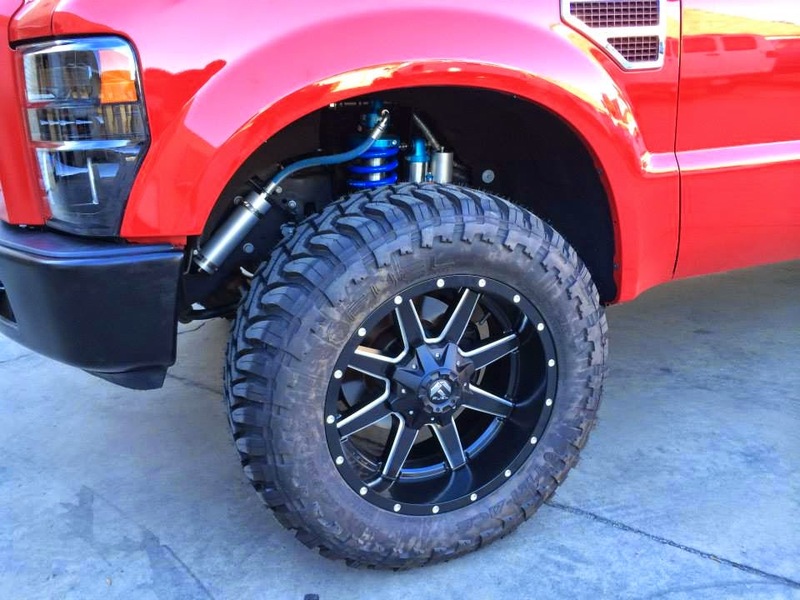 This is Carli's Ford F250/F350 Super Duty 2.5" Lift Coilover/Bypass Kit (the younger brother of this kit). It replaces the factory coil buckets with heavy duty shock mounts and uses bypasses in the rear. As far as performance suspension systems go, it doesn't get much more extreme than this. Aside from the shocks and shock mounts, this kit includes Carli's Super Duty Adjustable Track Bar, Carli's Ford Super Duty Deaver Leaf Springs, and miscellaneous hardware such as alignment cams, brake line relocation brackets, etc. Here is another up close shot to show off this suspension system. Here is a brand new F350 Platinum Edition sporting Carli's Ford Super Duty Front Leveling Kit. This kit includes Carli's 2.5" Lift Leveling Coils, Carli's Adjustable Track Bar, Bilstein 5100 shocks, and miscellaneous hardware. This kit is a nice improvement over factory ride quality and provides a great off road look!